So many moses baskets on the market but which should you buy? which could you try ? and which baby shops to buy a moses basket from? Here is food for thought before you decide which is best for you? 1.Is it a New moses basket you need? should you buy second hand, if cost are a major factor in deciding which to buy and you are thinking of owning a hand me down make ure it is clean and safe no loose or lost parts and wicker safeley tucked in. ALWAYS! ALWAYS! buy a new moses basket matress instead of using the old one even idf it seems clean. for health and safety reasons PROTECTING your baby see BPA for baby safety regulations and new bi laws. 2.With so much competition why not opt for a neutural colourway to go with your babyes nursery so you can use it agin for more children further down the line.One with a sturdy base or rocker is a good option. Do not use one with pillows for babies there is risk of sids(sudden infant death syndrome). 3.Thick quilts can look appealing and cute but remember to cover your baby with thin sheets and blankets rather than an extra thick quilt. 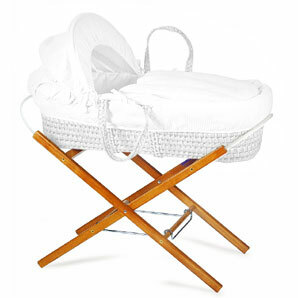 baby's cannot regulate their own body temperature and so need several layers which can be removed easily or added to make sure you have a room temperature on the wall of the nursery or baby's bedroom baby will be using so you can regulate the moses basket accordingly, usually there is a danger mark on the thermometer when the room is much too warm.